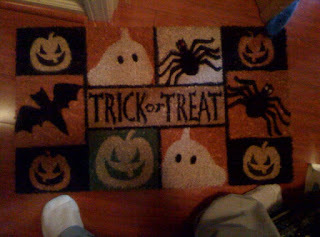 T his is the mat I found at Kirkland's in the mall for $10. I also signed up for their email mailing list while there, and have gotten a few since then, but none October/Halloween-themed. I also didn't find anything on their linked website at http://www.kirklands.com/. They also had several hand towels with pumpkins and witches, and a glittery small pumpkin (maybe '10 tall, 1 or 2 wide) decoration.